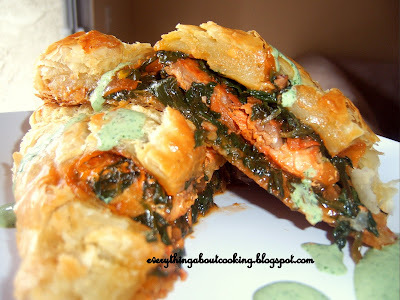 .....my culinary adventures: Daring Bakers December Challenge, Salmon en croute!!! Daring Bakers December Challenge, Salmon en croute!!! December's daring cooks challenge was Salmon en croute. I've never heard of it and was pretty intimidated till I read the recipe. Simone gave a step by step process. I made some changes to the recipe. I sauted the spinach with onion, garlic, salt and red chilly pwd. Rubbed the salmon with tandoori mix and also some salt , redchilly pwd and lemon juice. Made a sauce with cilantro, mint, green chillies, lemon juice, sour cream , yogurt, cumin and corriander pwds, salt. I also used store bought pastry sheet. 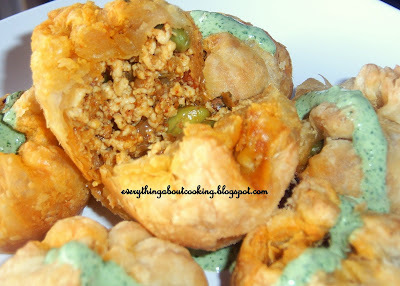 I also made chicken curry pouches with leftover chicken mince curry. 1.If you are making the short-crust pastry yourself; make sure not to add too much water as that will render the pastry too hard, making it impossible to roll out into the needed size. I made that mistake for the first batch and ended up using store-bought instead. 3. The recipe does not call for adding any extra salt or other seasonings to the salmon. I found that the salmon could use just a little bit of extra flavor, so feel free to add some seasoning to your liking. Be careful not to use too much as the topping also adds flavor. oh wow! very impressive! this looks great!